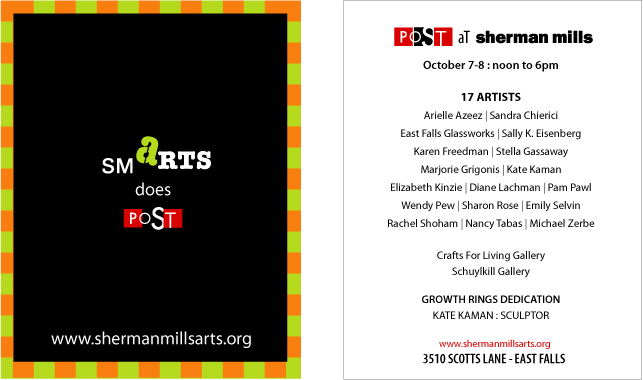 On the smARTS does POST weekend I’ll be one of over 17 artists at Sherman Mills that will have open studios the first week of October as part of POST [Philadelphia Open Studio Tours]. Sherman Mills has a large art community including two commercial galleries, glass-blowing, stained glass glaziers, potters, painters, textiles, and letterpress! The smARTS does POST weekend will also include a dedication ceremony for Kate Kaman’s Growth Rings sculpture recently installed at Sherman Mills. The ceremony will include an introduction by Mark Sherman and a short talk with video presentation by Kate Kaman. There will be commorative buttons and posters available designed by smARTS members (a donation is requested). I hope you can make it. See the smARTS website for directions. I’m happy to announce that five of my new works have been chosen for the Sherman Mills Contemporary Works Group Exhibition. Five of my new works are included one of which is shown above: constellation indigo. If you are in Philadelphia please come buy and see the show. I am in the company of the following artists. Michael has me going on this theme now. Things with my name on them… or are they things named after me? 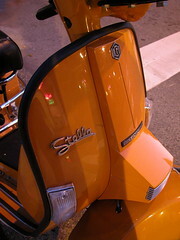 This is a very orange Stella scooter that I shot on my way back from Washington Square in Philadelphia. They use to have Stella rallys in Philadelphia but I can’t seem to find the URL now.